The region has cleared out and seasonable weather is expected through Saturday. Temperatures will moderate into next week with a more substantial chance for rain followed by much cooler air. The Baton Rouge area just missed registering a “top 10 driest fall” after receiving 0.78 inches of rain on Thursday. The season tallied a total of 6.4 inches of rain making it the 13th driest September to November at Metro Airport since 1930. Today and Tonight: Friday will bring ample sunshine with high temperatures near 71 degrees. Winds will be light and northerly. Overnight will remain clear as low temperatures bottom out near 49 degrees. Up Next: Sunny and seasonable weather will continue on Saturday with temperatures no more than 3-5 degrees above average. Sunday will be milder with increasing clouds. While the fine details are unclear, especially with regard to timing, a deep storm system will move into the region early next week bringing a good chance of widespread, measurable rain in the Monday to Wednesday timeframe. While the precipitation timing still needs to be hammered out, confidence is high that once a cold front blasts through the area by the middle of next week, much colder air will arrive. There may be several days with highs in the 50s and morning lows near freezing. The chill may even last through next weekend. The Tropics: The 2017 Atlantic Hurricane Season has ended. There were 17 named storms and 10 hurricanes with 6 reaching major category three strength or higher. All of these tallies exceeded the historical averages. CLICK HERE for more on over a dozen broken records, including the worst from Harvey, Irma and Maria. Surface high pressure will build in from the north Friday through Saturday morning with dry air remaining in place. This will promote modest diurnal temperatures ranges with seasonably cool mornings in the upper 50s and afternoon highs slightly above average in the low 70s. Just enough moisture may remain, with dew points in the upper 40s and low 50s, that some patchy fog may develop as radiational cooling allows substantial cooling of temperatures down to saturation. A mid-level ridge will allow some moderation of temperatures over the weekend before a fast moving shortwave trough moves by the region on Sunday. This wave will create increased cloud cover on Sunday, but rain is not expected at this time. The next big weather system will come in the form of a deep longwave trough digging into the Eastern U.S. early next week. Models are struggling with timing, but the broad details suggest a significant regime shift. Given the amplitude of the approaching trough, moisture should pool sufficiently to produce more widespread, measurable rain across the forecast area. Specific timing on this is not yet clear but as this time, showers will be mentioned in the forecast from Monday afternoon to Wednesday morning. 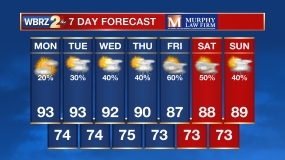 Showers are likely until a strong cold front clears the region by the middle of the week. Forecast models agree that the deep trough will result in well below average temperatures from the middle of next week into the second week of December. 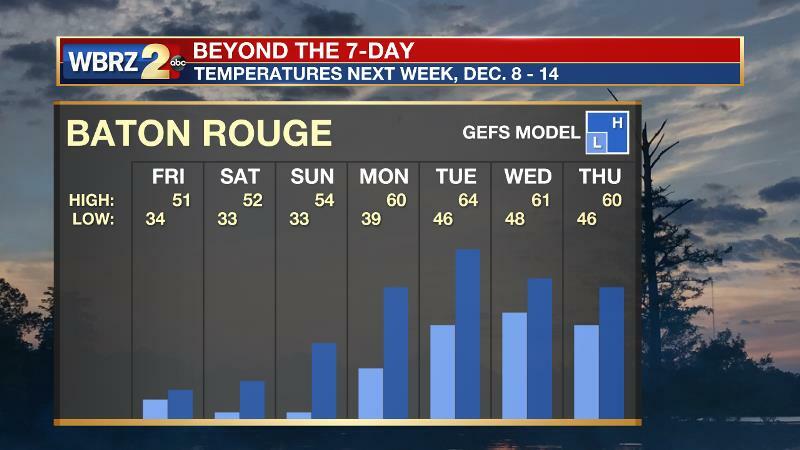 In fact, while metro Baton Rouge is now running about a week past the historical average first freeze, a run of several mornings near or below freezing is suggested by models later next week.